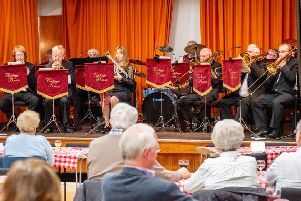 A former Caythorpe musician will be bringing her group back to the area to play for an audience in Sleaford. Trio Alexander will be back on Lincolnshire soil at the Source (Riverside Church) in Southgate, on Sunday, July 17. The group includes harpist Rosanna Moore, who lived in Caythorpe Heath from 2000 to 2005. It is here that her talent was discovered first by local priest Canon Brian Lucas and then Sleaford resident and music promoter Vi Hill, who staged concerts for Rosanna at Sleaford Playhouse and Stamford Arts Centre. Rosanna moved away to pursue her music career with the trio, which also comprises American musicians Adam Paul Cordle on viola and Caroline Sonett on flute. All three are studying for their doctoral degrees at the Eastman School of Music in the USA. Between them, they have performed at prestigious venues such as the Royal Albert Hall, The Barbican and The Smithsonian Institute. The Sleaford concert features pieces by Jacques Ibert, Elizabeth Poston, Michael Frazier, William Mathias and Claude Debusey. Tickets are £8 and can be purchased from Wilcox and Carter Jewellers or Scarletts in Bristol Arcade, on the door or by calling 01529 300331.